Constructed of machined stainless steel and aircraft grade 6061-T6 aluminum, the LX800 mount presents a rock-solid platform with precision roller bearings on both axes and a 1.75 inch stainless steel R.A. shaft. Its .68 inch diameter brass worms and 5.8 inch diameter, 225-tooth aluminum gears deliver smooth, precise movement with up to a 90 pound instrument load. Add to this internal cabling and the AutoStar II fully-computerized GoTo system with GPS, with a database of over 144,000 objects. All this sets atop a new ultra-stable tripod. StarLock — the heart of the LX800 — is the revolutionary new technology that makes target acquisition on your imaging sensor and accurate guiding during exposures completely automatic. 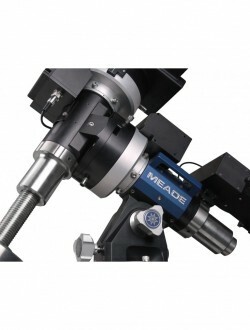 With Meade’s exclusive LightSwitch technology at its core, StarLock uses a 80mm f/5 optic and a super wideangle lens in a two camera system that automatically finds your target in high-precision, immediately captures a field star as dim as 11th magnitude and then guides to an incredible accuracy of one arcsecond. StarLock achieves this amazing accuracy because, unlike add-on guiders, StarLock is integrated into the telescope control system and communicates directly with the motor controllers in real time with a maximum precision of 0.01 arcseconds. There’s no need for a separate guider or computer and the StarLock requires no calibration, no user focusing or guide star selection. StarLock even automatically programs periodic error correction and then corrects for any other errors down to virtually zero. 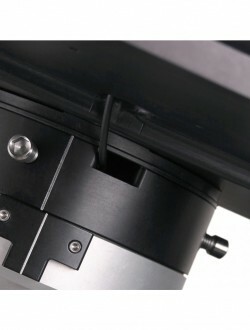 StarLock also provides computer-assisted polar alignment using the drift method for extreme precision. No expensive shaft encoders or add-on guiding systems can provide this level of performance. Includes single 26 lbs. stainless steel counterweight. Heaviest sub-assembly is 26lbs. 26 lbs. single stainless steel. 25mm x 26mm f/1.04 optic with 1/2 inch format CMOS sensor gives field of 14.72 x 11.78 degrees. High Precision Guiding +/- 1 arcsecond RMS (with good seeing. 1-4 second crrection update rate depending on star magnitude. Faintest guide star 11th mag.